Core Tools are considered a standard throughout the automotive industry. 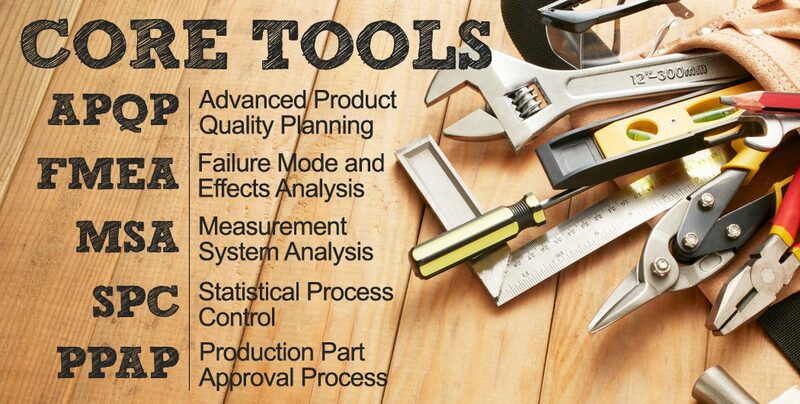 These five tools that are used throughout a product’s lifecycle, from development to production and delivery, are the fundamental building blocks to a Quality Management System that consistently produces the right products on time. In fact, the aerospace, defense, pharmaceutical and medical industries are adopting core tools as their standard requirements throughout their supply chains in much the same way that the automotive industry has done with IATF 16949. This set of core tools facilitates communications between suppliers and customers by providing a common language and process for designing and manufacturing products. Effective use of the Core Tools requires a common language and understanding of how the tools work. One option is public seminars and another is bringing the training in-house; neither is ideal. Traditional classroom training can be a huge drain on resources; both time and money. Online training is a cost-effective, flexible alternative approach to training. QualityTrainingPortal’s online Core Tools Training offers an alternative that can fit into daily work demands and assure that everyone is on the same page without compromising quality. Training can be fit into the work schedule, for example, one hour at the end of each day. No need to be out of the office for full days to attend a seminar. All employees going through the training learn the exact same material and terminology. Getting new employees up to speed is as easy as registering them for the online courses. People with a solid knowledge of specific topics can quickly move through the training, take the tests and complete the course. If someone isn’t going to be using one of the tools, they don’t have to take that training course. You, as the administrator, decide the actual curriculum for each employee. If someone needs more in-depth training (for example, Advanced SPC) just add that course to their curriculum. Without compromising quality, the cost of training is a fraction the cost of instructor-led training. Travel costs are eliminated. Administration is easy using the QualityTrainingPortal LMS or integrate the courses into your own LMS. Training is available when you need it; not when the seminar is offered. Advanced Product Quality Planning (APQP) defines a process for creates a roadmap for developing new products complete with time-based milestones and decision points along the way. APQP is considered a core tool because it is a vehicle for suppliers and customers to work together when developing a new product. This helps assure that the product is delivered on time and with the highest added-value. New Product Introductions (NPIs) have a greater success rate when the principles of the APQP approach are followed. Failure Mode and Effects Analysis (FMEA) is a core tool that uncovers potential failure modes, assesses the risk those failure modes and establishes action priorities to mitigate the highest priority risks. FMEAs can be conducted on both designs (DFMEA) and processes (PFMEA). Measurement System Analysis (MSA) is critical core tool because it assures that the measurements you are taking are accurate. If the measurement system is not giving your accurate information, then it will be impossible to know if product is being produced meets the customers’ requirements. Statistical Process Control (SPC) gives operators a tool to monitor stable processes and to identify when the process is going out of control due to special causes so that problems can be addressed before product quality is affected. SPC is an important core tool because it sends signals with a capable process is statistically shifting outside of the range of normal, expected variation. Production Part Approval Process (PPAP) provides a formal, standardized framework for customer-supplier communications regarding the specification and quality requirements for products, parts and materials. As a core tool, PPAP ensures suppliers and customers both have the same understanding of product requirements and how those measures will be evaluated and confirmed. Advanced Statistical Process Control (Advanced SPC) goes beyond our Basic SPC training and prepares learners to set up control charts, determine the best chart to use for a given situation and also provides extensive training in conducting a process capability study. 8D Problem-Solving uses one of the most commonly accepted models for problem-solving following the 8 Disciplines to teach learners how to systematically understand, analyze and solve problems. Because our training is online and available 24/7/365, you determine your training schedule, based on your needs and time available. Courses can be taken one after another and the curriculum could be completed in one to two weeks. Another approach might be to require completion of one course a month, which means the Core Tools Training would be completed in 5 months. The choice is yours. Cost of the Core Tools Courses depends on how many people are going to take the training. For an individual, cost for the 5 courses is less than $300. Quantity discounts can reduce the cost of the training for companies and work teams who purchase subscriptions. This will explain how credits are purchased that can then be used to assign training courses. Curriculums are purchased the same as any of our courses - you purchase credits and then assign courses to learners. Multiply the number of credits for your chosen curriculum by the number of learners you wish to train. This is the number of credits you need to purchase.